The Sector 17 shopping zone is all set to get a multistoreyed parking with the Municipal Corporation's Finance and Contract Committee approving a proposal in this regard. Traffic on the Zirakpur-Dera Bassi stretch was disrupted for more than 10 hours after a truck broke down on the Ghaggar bridge late last night. Hundreds of passengers and motorists were stuck in the jam. The local administration and the police made no attempt to divert the traffic from the intersection of the Chandigarh-Ambala and the Panchkula-Patiala highways at Zirakpur towards Rajpura. The Housing Board, Haryana, HUDA and the municipal council, of Panchkula have locked horns over who is to ensure that schools running in residential areas of housing board colonies here are closed down. The District Magistrate (DM), Mr Arun Kumar, today ordered the suspension of the licence of KC cinema as the management did not get an electricity connection re-installed as they were unable to pay the fine levied by the Electricity Department. The cinema management had sought one-month time in this regard. "Arrogance of power and wealth need to be eschewed,violence shunned and intellectual integrity respected to ensure a quantitative distinction to our democracy and politics," says Mr Ashwani Kumar, who was honoured with D.Litt (Honria Causa) degree by Panjab University at its annual convocation here on Tuesday. The Election Commission of India today informed the Punjab and Haryana High Court that no fresh appointments can be made in Haryana till the election results are announced. This happened during hearing of the petition filed by Dr Ashok Kumar of Hisar, seeking directions to the respondents to allow the candidates selected for the post of Haryana Veterinary Service (Class II) to join their place of posting. Which is the best way to verify the authenticity of educational consultants? The best way to check about a consultant is by way of references from friends who are pursuing education abroad. Internet is also helpful in this regard. Navneet Anand, Director of Globe Education Marketing Consultants, Sydney. Giving a presentation on an integrated monorail transport system connecting Chandigarh, Mohali and Panchkula, the Chairman of Metrail India, Mr Zafar Saifullah, claimed it was the cheapest and most viable mass rapid transport option for the three cities. Non-functional, a nightmare for pedestrians and devoid of life with overpowering concrete buildings. If you thought that Chandigarh is on the global map as a symbol of architectural excellence, then the city’s “lack of Indianisation” appears a lacunae to the visitors, especially when they are two expert architects who have reached the pinnacle of their field. “Change is the essence of life. It’s about time to grow out of the Le Corbousier’s concepts,” says Mr Uttan C. Jain while counting the failure of the experiment called Chandigarh. About a year-and-a-half after a terrorist attack on an army camp near Jammu killed a brigadier and nearly annihilated the Northern Command top brass eight army personnel have been charged with cowardice, it is learnt. The Punjab Dairy Development Board organised an awareness camp in Kharar to check quality of milk. Out of the total 70 samples checked, 46 were adulterated while 14 were below standard, said the PDDB. The BJP and the RSS had no role in the freedom struggle and even the former union government had refused to recognise the role of the Kuka and the Kamagata Maru movement as part of the freedom struggle. Expressing concern over the rehabilitation of the tsunami-hit, the US-based the Second Foundation Inc, led by its managing partner, Mr Pardeep Bakshi, and the local area in charge, Col T.S. Bakshi (retd), today presented a cheque for Rs 2.5 lakh to the UT Administrator, Gen S.F. Rodrigues, as contribution towards the Prime Minister’s National Relief Fund. Have you fallen in love? Experienced the springtime in your life? When your soul was full of music and the world around appeared clothed in brilliance and beauty? The Uttar Haryana Bijli Vitran Nigam (UHBVN) will open four new bill collection centres at the complaint centre in Sector 8, a switching sub-station at Mansa Devi Complex and indoor substations at Swastik Vihar and Sector 20. The Enforcement Wing of the Municipal Corporation carried out an anti-encroachment drive in Sector 22 here today. The backside of the shops was the main area of the operation. The area had been encroached upon by the shopkeepers and some of them had even put up small tents. Three autorickshaw drivers and a police constable found a woman’s purse containing Rs 5,000 and jewellery lying on a road and instead of pocketing the goods, they searched the purse for the address of the owner and then returned it to her. In protest against “police inaction” against two shopkeepers, a number of shopkeepers, today gheraoed the Dera Bassi police station. The protesters were demanding the arrest of Raju and Kala who allegedly assaulted Amarjit Singh, owner of a shoe shop, after an alteration. Two councillors of the Bhartiya Janata Party today submitted their resignation to the Mayor of the Municipal Corporation to protest against the unfair representation in the MC committees. The police busted a call girl racket here last night and arrested 10 persons, including five women. The racket was being operated from a house in Phase 1. A head constable of the Punjab police was also living in a portion of the house. The UT police today arrested Sunil, a student of BA-I of DAV College (Sector 10), for his alleged involvement in the Randhir Singh murder case. The police has also registered a case of murder against him. Hundreds of residents converged at Sri Ganesh Home Appliances in the wee hours today in order to loot the third godown of the shop. However, timely action by the police prevented the looting of the shop. Punjab Technical University (PTU) will confer a PhD degree on the chairman of the UK-based Caparo Group, Lord Swraj Paul, tomorrow in recognition of his excellence in the field of manufacturing industry, education and philanthropy. Punjab Technical University (PTU) will start skill-based vocational courses in over 20 schools and polytechnics across the state. The courses, specifically designed for rural schools and polytechnics, will aim at providing self-employment and job-oriented education to matriculates and Class 12 passouts. A six-week technical enterpreneurship development programme on fashion technology was inaugurated at the Northern India Institute of Fashion Technology (NIIFT) here today. Students of Kiddies World Preparatory School, Phase XI, here celebrated their annual day today. Mrs Lakhwuinder Kaur Garcha, OSD to the Chief Minister, Punjab, was the chief guest. S. Teja Singh Kandhari Public School is the brainchild of the late S. Joginder Singh Kandhari, a great visionary and dynamic personality, whose thinking was always futuristic. No nation can progress without education, hence he was all for the best of education to be made available to the residents of Patiala and its surrounding villages. 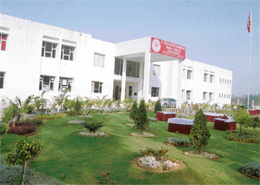 THE school has marched forward ever since its affiliation to CBSE in the year 2001. Now the school has been upgraded to +2 level in the coming session 2005-2006. Students will have a wide choice of streams as we are going to have all steams i.e. medical, non-medical, commerce and arts. Rohit Sachdeva and Priyanka Soni were adjudged Mr and Ms DAV, respectively, at a farewell party organised for students of Class XII of Chamanlal DAV Senior Public School, Sector 11, here on Wednesday. As part of their ongoing agitation, teaching and non-teaching employees under the aegis of the Joint Action Committee stage a dharna in front of the office of the Vice-Chancellor, Panjab University, today. 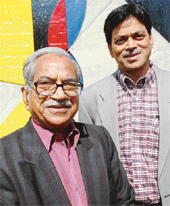 A cultural event Mosiac-2005 was held at the Indo Global College of Engineering, Abhipur, near Chandigarh, yesterday. Kanwalpreet Singh and Ginni Priya Kalsi were adjudged as Mr Fresher and Ms Fresher. 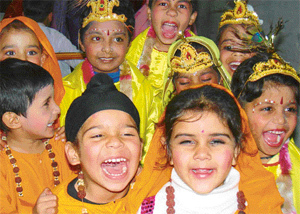 Bhangra and Gidha were the chief attractions at the function. The two-day seminar on “Human excellence according to Swami Vivekananda” organised by the Centre for Vivekananda Studies, Panjab University concluded yesterday. Seventeen students from different parts of India participated. Four students were given cash prizes for their essays on Vivekananda’s views on human excellence. Students of Pustak School had a field day today as over 74 students from the Sector 25 school, adopted by Vivek High School, Sector 38, thronged the latter’s school grounds to participate in their annual sports day. Mr Samson Masih, Principal of the Delhi Public School, Himshikha, Pinjore, was conferred with ‘Avantika Dr Radhakrishnan Award’ for his contribution towards education, environment and social work. A clash took place between the two rival groups of the students at the Student Centre in Panjab University today evening. The trouble began when Gurpervez Singh Sandhu of the ABVP group, accompanied by his supporters in two jeeps, came to the centre in the evening to look out for Amandeep Singh, a student of the Department of Laws and also the leader of the Panjab University Students Union. The two accused in the maid Rani’s death case — Saurabh Vermani and his mother Kaushalya Vermani — were sent to the judicial custody by a local court. The duo were produced before the Chief Judicial Magistrate, Mr Gulab Singh today. Fourteen executive committee members of PCCTU, led by its co-president R.S. Brar, courted arrest in protest against the “indifferent attitude” of the Punjab Government towards the demands of teachers. They were released in the evening. Fresh cases of alleged irregularities in the recruitment of constables in the Chandigarh Police have been filed in the Central Administrative Tribunal (CAT). Candidates who had been rejected during the interviews have approached the tribunal, stating that the recruitment agency had fixed no criteria for the minimum qualifying marks required for the written test. ALL people dream, whether they want to or not and very few of us can make an image and display it on canvas. 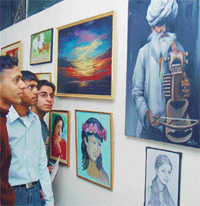 The arts gallery of the Department of Fine Arts at the Government of College in Sector 46, Chandigarh, however, is bustling with over 250 pieces of works in oil and water colours. About 100 enthusiastic students expressed their perceptions and beliefs, hopes and dreams, fears and fantasies in their exhibits. Senior citizens in the twilight of there lives are forced to lead a solitary life or fend for themselves was as they are turned out of there homes by there near and dear ones. Many state government are encouraging the handling over of old age homes to private institutions so that they can be run smoothly and efficiently. The radiant beauty of roses steals every heart. Get ready to lose your heart at the rose festival which will begin from February 25. Around four lakh people visited the festival last year. Cultural activities, musical nights and several competitions will be held on the occasion. Nearly 300 stalls will be put up where major companies will display their goods. An array of food stalls will be another attraction. An exhibition on physical fitness and health began at Dev Samaj College for Women, Sector 45, in Chandigarh on Wednesday. The two-day exhibition being organised by the DEAR Club of the college was inaugurated today by the Principal, Dr Shashi Bala Jain. The first academic session on the second day of the national seminar on human genetics, health and ethics in Research: Anthropological Perspectives today was on cultural approach to wards health and healthcare services at Panjab University. A meeting of the PGI’s institute body was held in New Delhi yesterday where the committee members decided to close the OPDs on gazetted holidays at the hospital. The decision was earlier approved in the staff council meeting held at the PGI. Poor patient attendance was cited as the reason behind the move. Reacting to a news item “Damaged Railing: no action yet” published in the Chandigarh Tribune on Tuesday, Dr V.J.S. Vohra, CEO of an artificial limbs manufacturing unit in Bhabhat village Zirakpur, claimed yesterday that the opening, in the railing was approved by the concerned authorities. The superb performance by Sania Mirza, India’s rising tennis star, has raised a ray of hope for the sponsors who were till now mainly investing in Cricket. 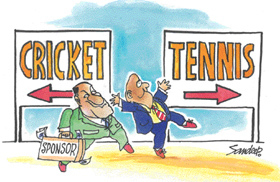 The Indian sports fraternity as well as the viewership has been overdosed with cricket and they too wanted a change. More so, the recent media blitz created by Sania’s stupendous show in the Australian Open and at Hyderabad meet further helped in giving thrust to tennis which in any case is quite popular with the masses. The UT Sports department has revised the booking rates for the Hockey Stadium, Sector 42. Now the revised rates for non-student category will be Rs 75 as admission fee and Rs 150 as monthly charges. More than 12 years after the Chandigarh Administration started acquisition of 54 acres of prime land on the Chandigarh-Panchkula road, the Land Acquisition Officer (LAO), Mr Setia, today issued orders for possession of 49.9 acres, leaving out the area of Darshani Bagh, Mani Majra.